People love Gladhill for its charming Maryland location and inviting, small-town courtesies, but we also bring new meaning to the term "local" delivery - with a wide delivery radius from our store. We'll take our old-fashioned approach right into your city locations and we are also able to deliver to your beach or mountain home location! Our preparedness begins with owning our own trucks and includes a working knowledge of traffic patterns that help us show up on time. We will call ahead to confirm and do our best to be accommodating and flexible to your specific needs. Gladhill Furniture offers professional service technicians who can provide in-home services for wood refinishing and upholstery, as well as other repairs. These services are good for one year from the original date of delivery on manufacturing defects. In rare cases, special steps need to be taken to restore your furniture. In cases like these, Gladhill will transport your furniture to our repair shop. We will then perform the needed repairs and return the merchandise to you at our expense. Your furniture is initially received at our Frederick County Distribution Center. After your merchandise is carefully unpacked, we go over it with a thorough inspection. Once your furniture is ready for delivery, you may either utilize our Furniture Delivery Service or you can pick it up. If there are small items that can be taken with you at the time of your purchase, we encourage you to do so. Our Distribution Center is located at 5301 Kings Court, Frederick, MD. Delivery times are subject to availability and your schedule. For all pick-ups, 24 hours notice is required. Our expert team of delivery specialists will care for your new purchase and give your home the respect it deserves. We aim to make your delivery experience with us both effortless and enjoyable. Included in our nominal delivery fee is the placement of your purchase, as well as inspecting, dusting, and a review of the operation of it. Customers rave about our Furniture Delivery Service as we make our 2-hour delivery window 100 percent of the time or your delivery is free! We will give you a call as soon as your furniture is ready for delivery. We know that you can not wait around all day for a delivery, so we will schedule a day for you and then confirm the preceding day with a two-hour window. All of our drivers carry mobile phones, so they are able to call you when they are on their way. If there is an unexpected delay, our drivers can inform you of that as well. If you need to cancel a scheduled delivery (or pickup) for any reason, please contact us no later than one (1) business day prior to your delivery, as this will save your furniture from any excessive handling. Please have your desired area cleared to receive your new furniture and please clear any small items away from the moving path (and the room) where your new furniture will be placed. We will assist you by moving your existing piece(s) away from the new item(s) you are receiving. However, this can only be done within the room the new furniture will reside. If you are in need of having other items moved to various areas of your home, we can do so for an additional charge. For a complete list of moving charges, please ask your Gladhill salesperson or our scheduler. Due to insurance regulations, our delivery team cannot be held responsible for damages caused by moving existing furniture. We will inspect the area where your new furniture will be delivered and we will place protective pads as needed. We will carefully set your furniture into place, then install, inspect, and clean. Due to its nature, our delivery specialists are not permitted to move or place any electronic equipment, including TVs. You will either need to have this done yourself or have qualified technicians available to do so. If needed, we will provide any necessary instructions on the operation or use of your new purchase. Your relationship with Gladhill Furniture is only just beginning once your purchase has been made. Beyond amazing additions to your home, you will also receive our utmost attention and care after your new furniture has been delivered. We're committed to responding to your concerns as quickly as possible. Don't be shy about contacting us with requests for advice, feedback about your experience or repair needs for your furniture. 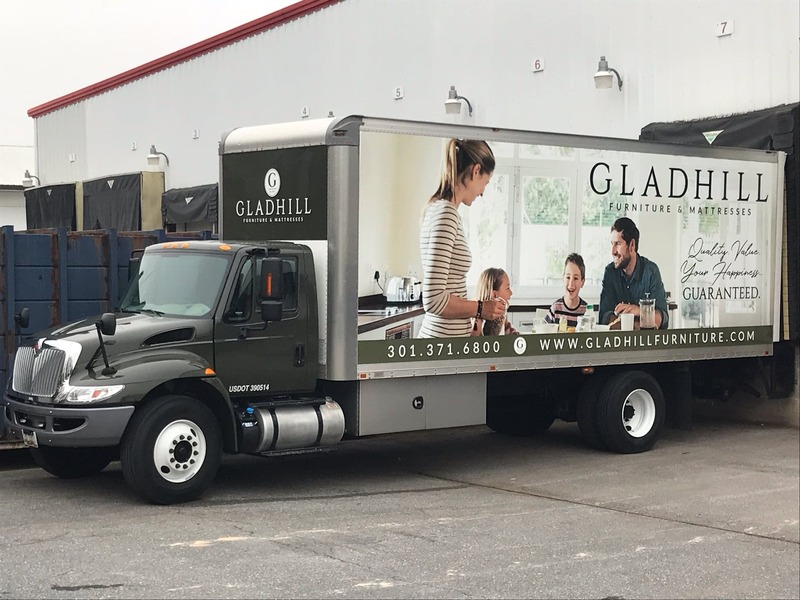 Please call our Customer Service Department at 301-371-6800 or email jnicholson@gladhill.com if you have a question or problem with your furniture. We will schedule an appointment to visit your home for an initial inspection, and our expert technicians can complete many repairs on the spot! If parts are needed, they'll be ordered from the manufacturer and shipped directly to your home, then we'll make a second visit to complete the repair. You'll be glad to know that most repairs can be made in your home; however, some situations will require the transport of your item back to our shop.